My rating: 8.5/10. Great watch, Titanium build. Today I’m doing a Armani AR0585 review. 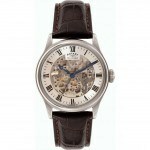 If you’re after a watch that is sophisticated yet elegant looking the AR0585 may be the ideal watch for you. 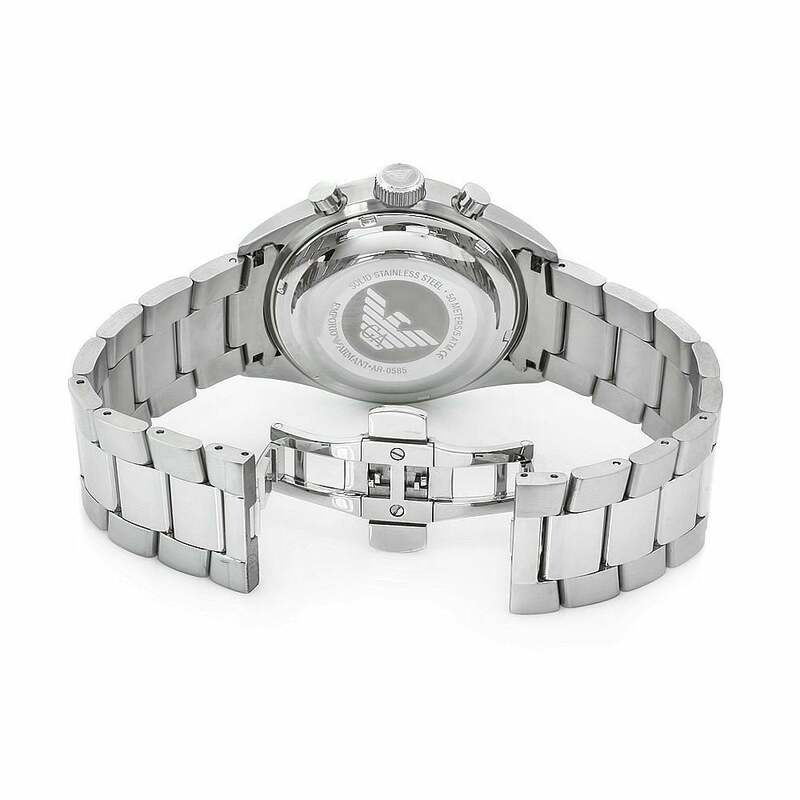 This watch keeps to Armani’s classic watch design for the most part however it’s dial features the logo used as a backdrop pattern which adds an interesting dynamic to it. It has chronograph time keeping with a small date display window, features we’ve become accustomed to seeing on many of the Armani watch range. 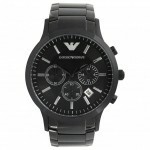 Armani continue to produce watches with a great build quality at fairly affordable prices for designer timepieces. One of my favourite features on this watch is it’s hidden double locking clasp that you’ll see in a picture below. 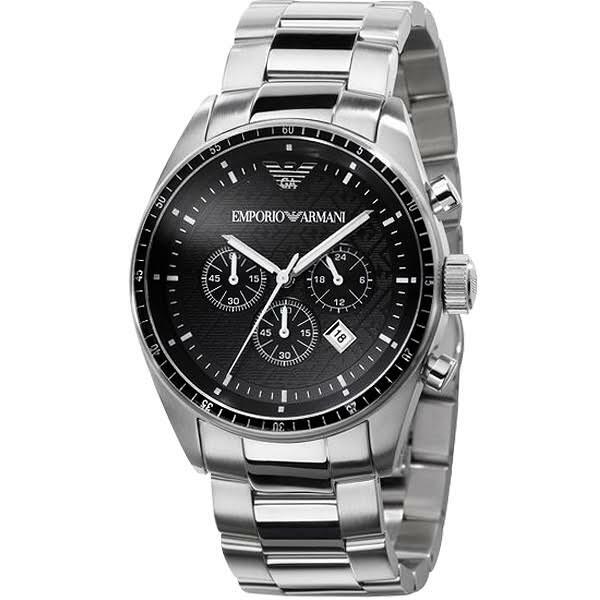 You may also like my 10 most recommended Armani watches for men. Band Stainless steel gloss & matt finish strap, standard length, 24mm width, double locking hidden release clasp. Case Stainless steel casing, sizing diameter: 44 mm and thickness: 16 mm. Dial Large display with chronograph sub-dials. Logo at 12 o’clock position and used for dial detailing. Specially hardened mineral glass offers good protection from scratches. Movement Japanese quartz movement with a analogue chronograph display. Water Resistant A water resistance of up to 50m / 5 bar. Double locking clasps are often favoured as a more impressive style of clasp for watches. 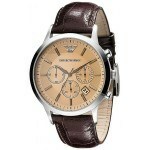 Armani are a very popular brand for designer watches. 50m water resistance, suitable for swimming, white water rafting, non-snorkeling water related work, and fishing. As with many designer brands you have to accept you are paying towards the brand name to some degree. The Armani AR0585 is a very nice looking watch with some interesting detailing on the dial that you don’t find on many of their other watches. Armani have been a top seller of designer timepieces for sometime now and offer a large variety of well build watches that people have come to love. I for one rather like the Armani watches and don’t mind paying the extra towards the brand name, they a built well and look great. Hope you enjoyed this Armani AR0585 review. Find more watch reviews below.